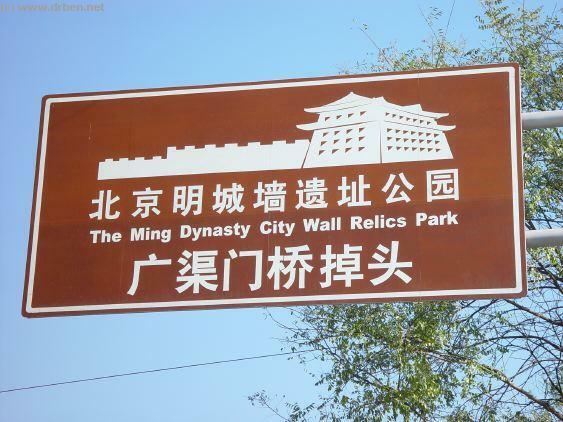 Beijing's Ming Dynasty City Wall Relics and Park are a collection of remnants of the Southern City Walls of the Historic Imperial Capital of China at Beijing. While moving away from the roaring engines of the usual traffic jam, study some of the last remnants of the original City Walls, enjoy the Kite Flyers , joggers and other leisurely Chinese and end your Walk at the Famed Red Gate Gallery. 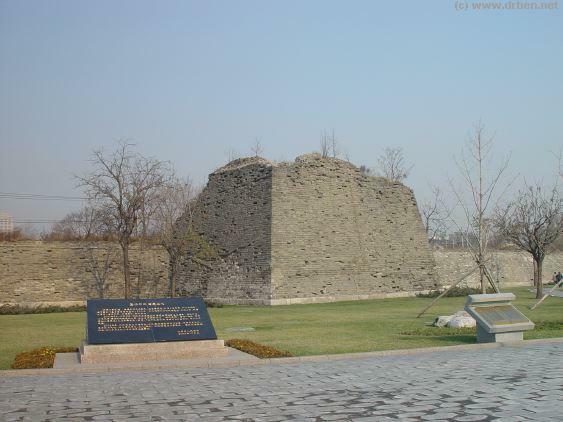 Starting West at ChongwenMen, site of a Former City Gate, the only path in the Park leads you slowly East past remnants of the City Walls , past a Former Guard House and parts of the former Beijing-Fengtian Railway, once the Main Railway leading into Beijing. Moving on East past more City Walls this full Impression ends at DongBianMen & Park, the South-East Corner Gate of the Ancient Imperial City, now more renowned as the Red Gate Contemporary Chinese Art Gallery. A Gallery started by China enthousiast Brian Wallace, and now world renowned and leading in its Field. 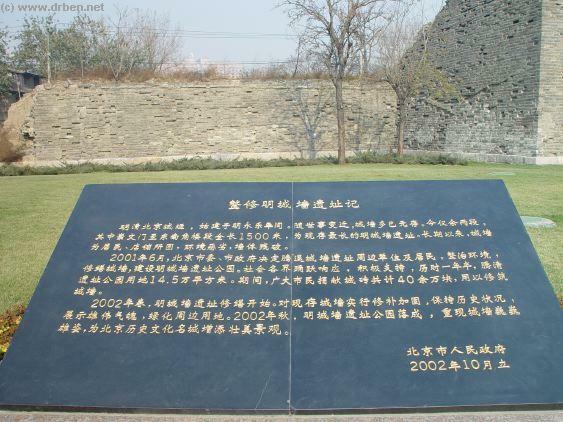 The Beijing Report includes full information and Impression on Red Gate Gallery and the Watchtowers Historic Exhibition and Museum on the History of Chongwen District, organised into a seperate but inter-connected Report. 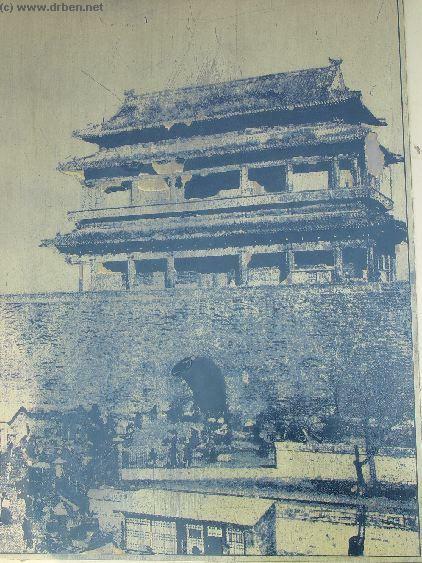 Source Book "Old Beijing - In the Shadow of (the) Imperial Throne"
A plaquette near the western exit of the park shows a historic image of the Chongwen Gate, as it was photographed in the late 19th century and before the destructive Box Rebellion and War which swept Beijing and the so called Legations Quarter which lay just beyond this Gate in 1900 AD. 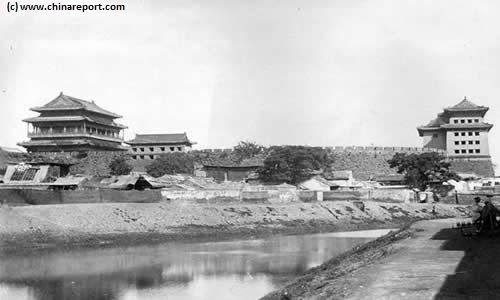 The construction of the Chongwen Gate, the Chongwen Men, started not too long after the official completion of the Forbidden City Imperial Palace of the Ming Dynasty (1368 AD - 1633 AD) and the official opening of the newly built Grand Capital in the year 1421 AD. Although the city was by and large complete, its city walls and various other defenses were not. 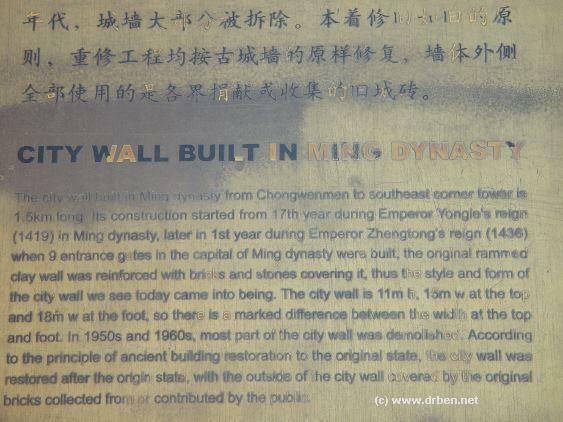 As an important gate, situated just west if the Main South Gate, the Chongwenmen was completed fairly early in the year 1436 AD, which was the first year of the Reign of the Zhengtong Emperor (Yingzong Reign period 1436 - 1449 AD) of the Dynasty. 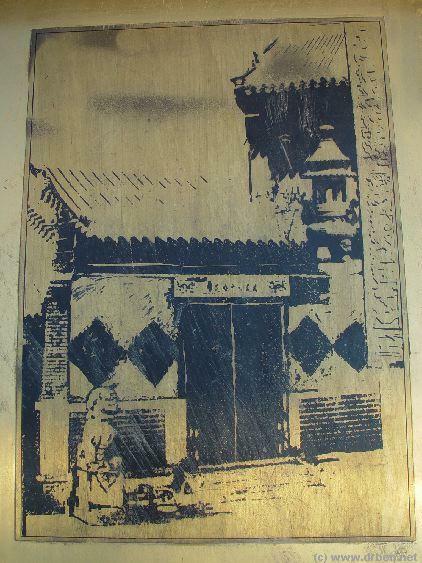 The first name given to the gate was Wenming Men, however during the early decades of the new Ming Capital, the locally preferred name for the gate was Haidaimen or Hademen. For unclear reasons, the gate was renamed only 3 years after receiving its first name, renaming it Chongwen, which is the name today still attached to the former location of this gate. In history, a tax post was developed at this gate in the 21st year of the Chenghua Emperor (Xianzong Reign Period 1464-1487 AD) of the Ming Dynasty. Later, during the 6th year of the Hongzhi Emperor (Xiaozong Reign 1487-1505 AD) of the Ming the status of the gates tax post was upgraded to serve all of the city, so that henceforth all goods entering the city must be decalred and taxed at this gate, the Chongwenmen. This taxation function for the whole city would would be carried forth well into the Qing Dynasty (1644 AD - 1911AD) and even beyond. 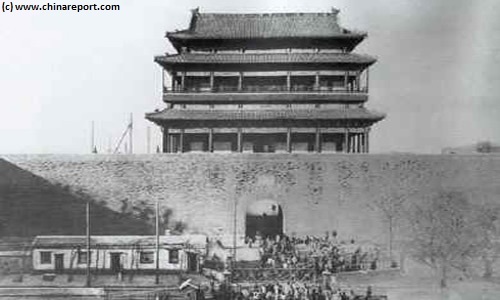 During both the Ming and the Qing Era's the taxation office of the Chongwenmen Gate was in charge of the collection of all commercial taxes in the city. Conveniently situated for ships arriving via the Grand Canal someays further to the East, and a multitude of camel- and other trade caravans arriving as well as departing continuously, this was truly and important but also massive task. The Chongwenmen Tax Office was relatively small but well staffed. It would be in function for well over 400 years before eventually being dismissed in the year 1930 AD (officially the 19th year of the (first) Republic of China) when the political situation and modern developments such as train transportation rendered the tax office redundant. 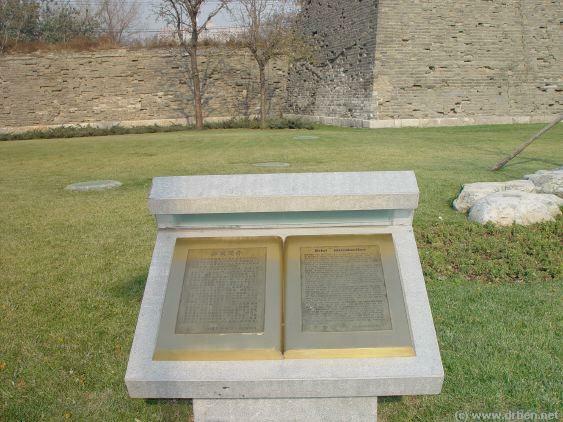 The Chongwenmen, altogether stood for over 500 years, against various invasions, wars and rebellions. The modern era In Beijing started in second half of the 19th century, when, humiliated in two devastating wars, the Manchu Imperial House finally found itself having to allow Foreigners within its gates. Although Foreigners had lived there before, as did the Ming Dynasty Era Jesuit Father Matteo Ricci, oreviously Foreigners had only been allowed in- or near the court in small numbers, and then only with very good reasons and especially negotiated permits for entering, or in the case of Matteo Ricci and subsequent Christians even gain residency. Whatever the customs of the past had been, all this changed with the coming of a Foreign Diplomatic Quarter to the city, a much resented consession eventually forced upon the Qing Dynasty by the power of the guns of the Foreign Invaders. 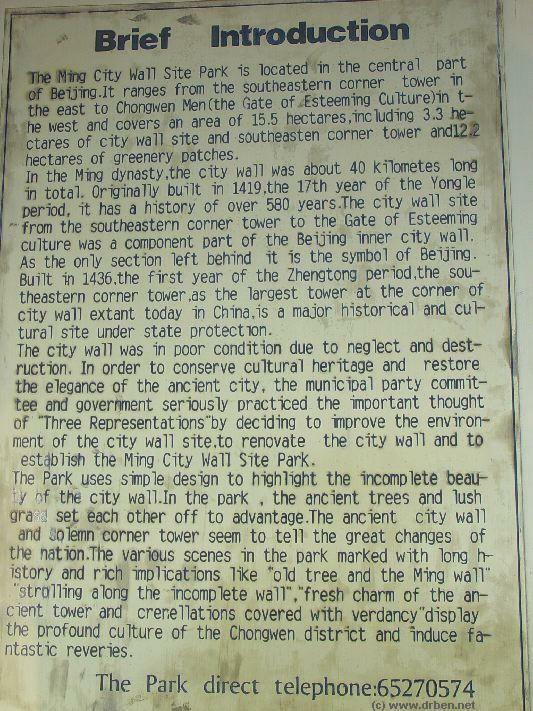 Henceforth, the Chongwenmen would serve as one of the gates yielding direct entrance into what was now known as ∢The Legations Quarter∢, a city district suddenly reserved (almost) exclusively for Foreign Residents, in case the Diplomats and Staff of the newly arrived Embassies of the British, The French, and subseuqently Americans, Russians, Austro-Hungarians, Dutch, Belgians and everyone else vying for influence in the newly opened state and territory. At the time, the Chongwenmen became the main south gate to the French speaking part of the Colonial Embassy Quarter with this gate giving access directly to the south to north road by then elegantly redubbed as the ∢Rue Marco Polo∢. 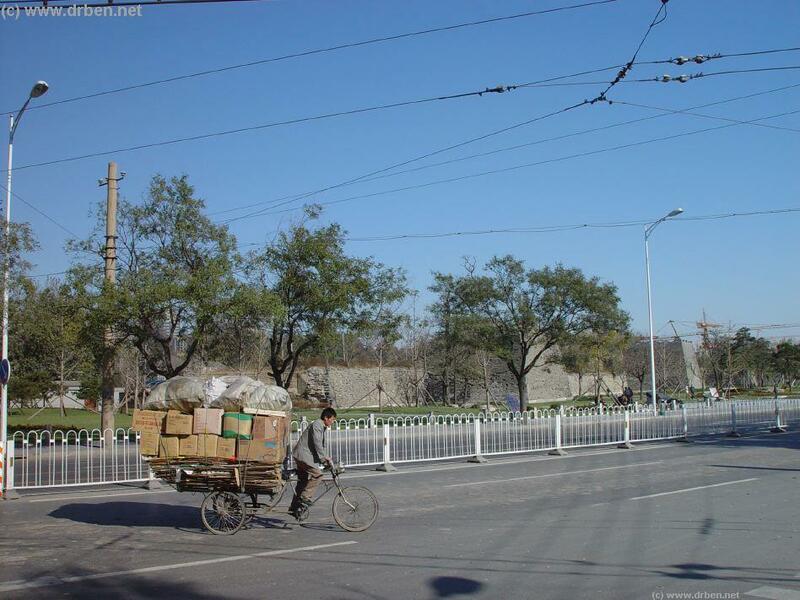 Although a partial Foreign take-over of the city was underway, the Chinese court attempted to return to business as usual, hence the trade caravans kept arriving at the Chongwen Gate and its tax office remained in function. As one may find, several hundred meters up the road inside the Gate one will find the ∢Rue Hart∢, the small street named in rememberance of Sir Robert Hart, the Foreign overseer of Tax Affairs in the city during the later stages of the relations between the Colonial Powers and the slowly dying Manchu Qing Dynasty. Although it would go too far to recount the history of the Qing Dynasty Tax Office at the time Robert Hart worked there, it may be worth knowing that due to his diligence in function, and his honest service for the Chinese State Coffers, he is one of the few Foreigners of the Colonial Era who are remebered with kindness in China, even today. In China Sir Robert Hart is regarded as an examplary man which is a fact that fully accounts for the survival of the sign naming a street after him at just a short distance walking from the Chongwenmen Gate. Even closer to the Chongwenmen Gate, inside the Legations Quarter∢ at the intersection with East Legations Street stood the French Roman Catholic Church (St. Michael) for the use of French and the Belgians, which rebuilt after suffering major damage during the Boxer War in 1900 AD, still stands today. With a large symbolic significance, it was among the first Churches to be reopened in China. Hence, since somewhere in the early 1980's and even has active services. Additional plaquette depicting the Tax Office as it was situated at the Chongwenmen. Date of original Image unknown. Follow the winding path along the ruined but still impressive remains of the former city walls to get away from the road rage that has taken over the city after the year 2000 AD. 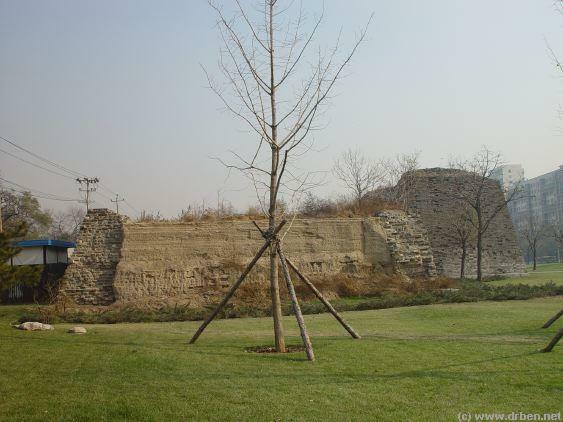 Eventually the walls lead to the south-easternmost watchtower of the city, which is also the largest watchtower to be found along the original Ming Era walls. 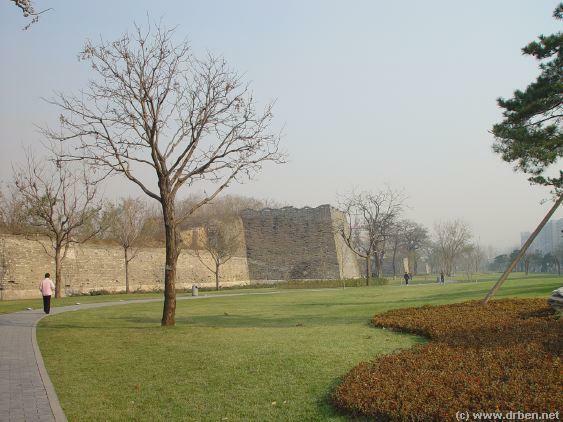 Although the Ming Era City Walls Park is by no means Beijing's most esthetic garden the greenery provides for some shelter from the busy movements of the city all around. The unique walk along what amounts to the best preserved and still original parts of the Ming Wall (except for the Ming Era Observatory) is however certainly a worthwhile experience. A view of Chongwenmen in the winter of 2004. In modern days a large intersection of the roads that have replaced the city walls and the surrounding moat. Although the city has further developed and new villas and malls have arisen to the south the Novotel at Chongwenmen still stands as shown in the photo. 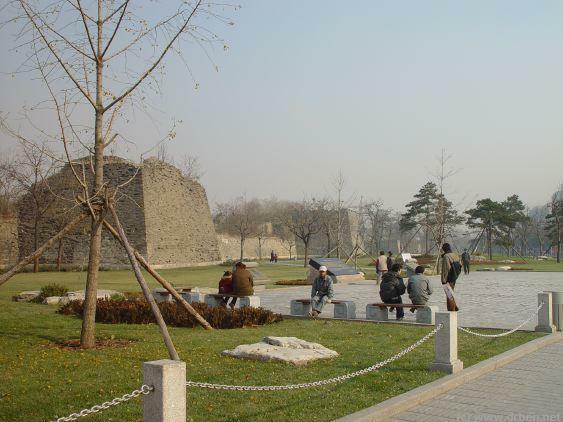 then dilapidated walls and their ruins were reconstructed for the public into a Park. 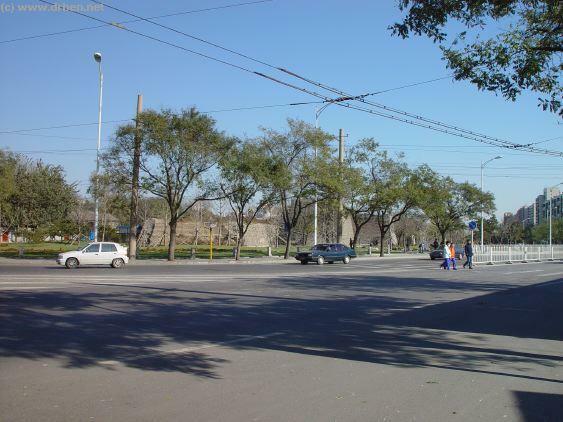 It was one of the first developement announcing the start of the metamorphosis that has by now created an entirely new and much modern modern city. City Walls Park is a welcome green addition to the, rapidly modernised, now bustling City Centre as well as an interesting place to retrace some of the Old Imperial City and it's huge Defensive Walls. 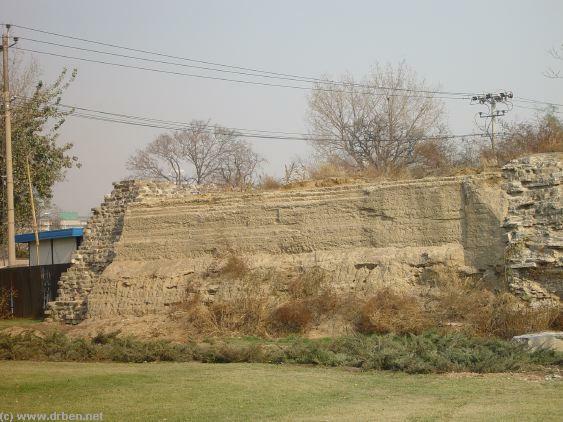 In addition of being an open air museum of the former Walls of the Imperial Capital of the past centuries, the park also houses a few relics dating from the earliest days of train traffic and train operations at and around the city of Beijing. 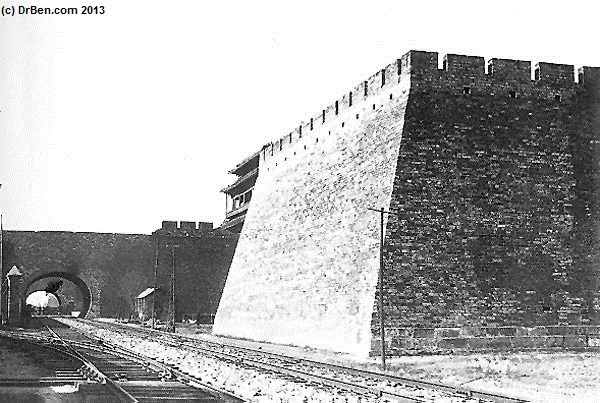 As section of what was once known as the Beijing-Fengtian Railway led from the Chongwenmen eastward and today, some railway tracks and a signal house of that railroad are found preserved within the park limits at a point about halfway to the south-east corner tower. 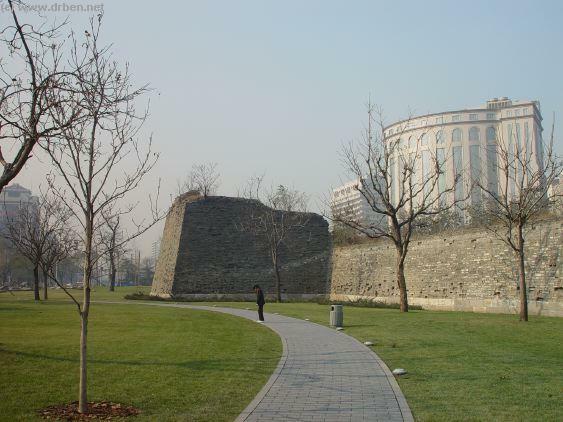 Last but least, the Ming Dynasty Era City Wall Relics Park terminates into the Park of the Dongnan Jiaolou or South-East Corner watchtower which one may explore at leisure. Although it is not one of the main tourist attractions in the city, a visit to the park is well recommended for those who would like to have an impression of the structures of the old Imperial Capital of bygone days. 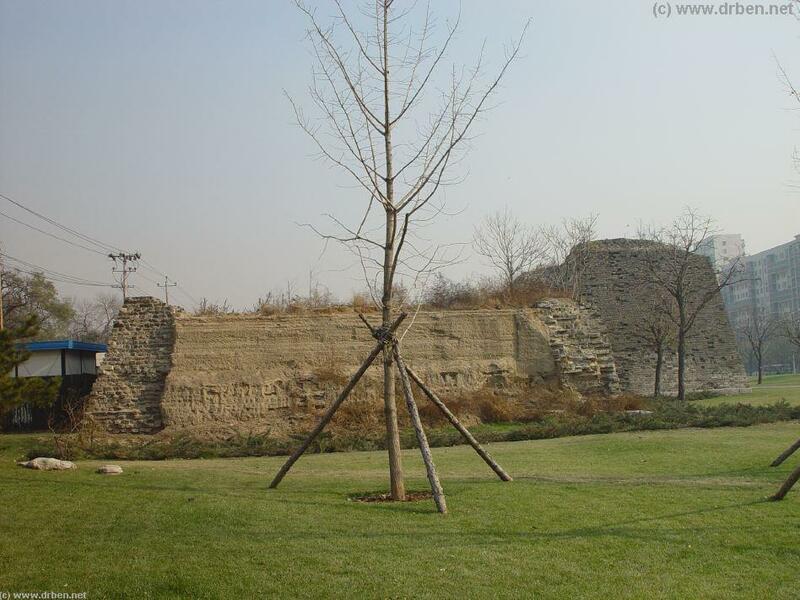 With the best Ming Era Wall remnants in the city today, the Ming Dynasty City Wall Relics Park is the only place see a complete length of original defensive wall. Enjoy an afternoon stroll through City Walls Park and relax from the crowds just a kilometer away at TiananMen Square and inside the Forbidden City. 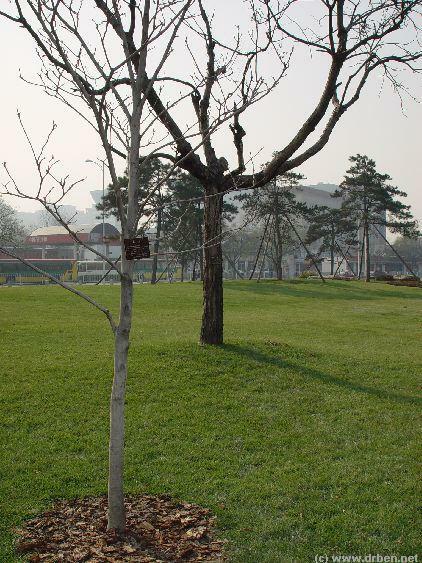 The park is located in north-eastern parts of the Chongwen District smack on the border with the Dongcheng District which extends further north from Chongwenmen. 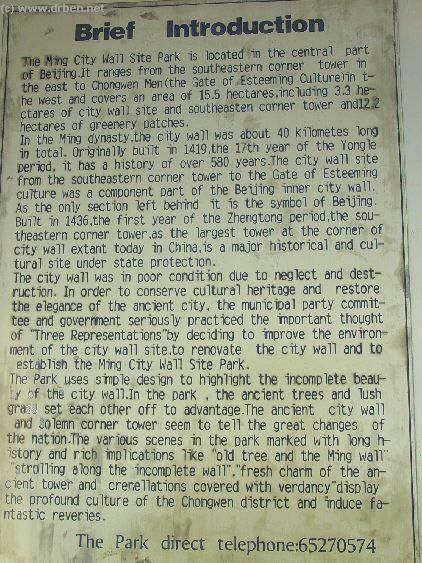 As the city walls mark the exact border between these districts and the park includes the walls plus a green zone to the south of it, the park lies just within the limits of the Chongwen District. Finding one's way to the Ming Dynasty Era Wall ruins and the park is fairly easy. That is, conveniently, Chongwenmen is one of the main stations of the circular blue line, which itself was one of the two lines of the original subway/metro system built in Beijing in 1971/72. Therefor, simply make your way through the subway/metro system to the circular line which goes around the old city center. Pick the Chongwenmen Station and wait for your arrival. As the western end of the former wall ruins can be found not too far from the location of the demolished gate proper, only a short hike remains to the gates of the park. 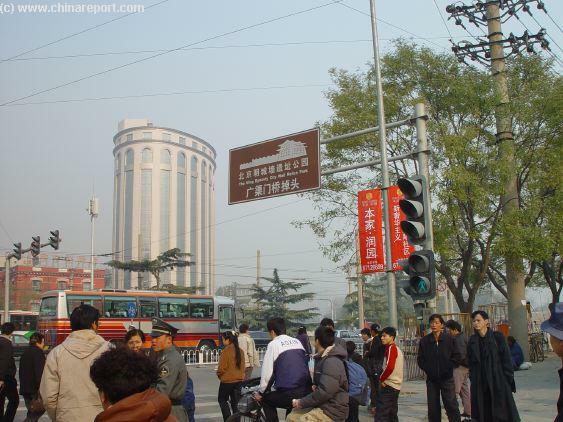 After finding your way to Chongwenmen Station, exit preferably via one of the eastern exits. Once outside and thus having a better overview one will notice some of the signs pointing the way eastward and down the road to the City Wall ruins, which at that point are not yet to be seen. In case of confusion, follow the road eastward while keeping south of the easily idetifyable round highrise shown in the adjacent photo. From the station it is but some 200 meters up te road to the entrance, which is not a real gate but just a path in the grass leading up to the first ruined wall remnants. From this point the city walls and ruins extend for more than a kilometer, eventually leading up to the south east corner watchtower, a massive Gate which can be visited and explored by the passing public. Standing on the south east corner of the giant and always busy Chongwenmen intersection there are two markers to point the way. Follow the signs while staying south of the rounded tower. 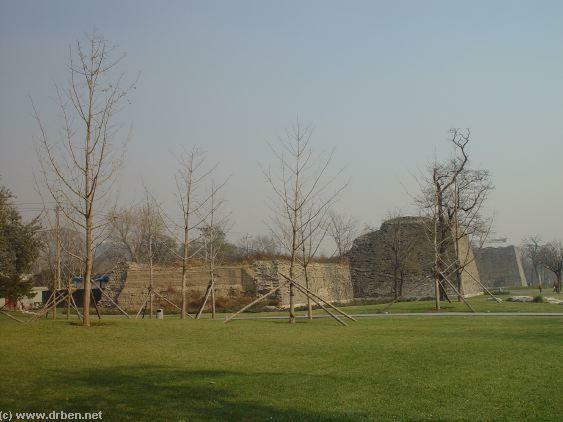 Only a blind person might fail to find their way from Chongwenmen to the City Wall Ruins Park. renowned Red Gate modern and contemporary art gallery of Beijing. A Visit to the Red Gate by itself is already a good enough to make ones way down the path along the ruined Ming Walls.